AUVERE, Estonia — Home to the creators of Skype and the first country to use online voting, Estonia relishes its image as a technological pioneer. But the tiny East European country’s most far-reaching economic achievement could come from how it has learned to squeeze oil from a rock. Estonia, a country of 1.3 million people, gets more than 90 percent of its electricity needs from oil shale — by far the world’s most shale-dependent country. But environmentalists in Estonia are concerned that large-scale shale mining could cause pollution and contaminate underground water supplies. Estonia’s oil shale resources are very different from the shale deposits that are now yielding enormous amounts of oil and gas throughout the U.S.
Estonia’s shale industry directly employs about 6,500 people, or 1.1 percent of the country’s workforce, and accounts for up to 3 percent of the nation’s economy, according to the Ministry of Economic Affairs. 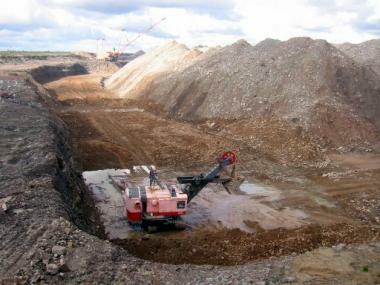 “We have almost a 100 years’ experience working with oil shale in Estonia. If you know something, and if there’s a market, you try to sell it,” said Tarmu Aas, a board member at Eesti Energia, a state-owned utility that accounts for nearly all the country’s shale and electricity production. By 2016, the country also hopes to begin mass-producing high-quality automotive diesel, a technology that would significantly boost the commodity’s value. “Estonia has put itself on the map of the world with oil shale. In this particular technology we’re good, we’re the masters,” said Konstantin Dotsenko, an Estonian energy trader. Aas said that for decades there’s been virtually no market for shale oil — the price for which is not quoted separately but as a rule is slightly cheaper than heavy fuel used to heat homes and power industrial boilers — since crude oil has been so cheap. Although they don’t exclude a sharp decline in demands and prices in the case of a severe global crisis, analysts generally believe oil prices will remain at between $80 and $100 a barrel as the threat of a global oil shortage all but disappears. “All signs point to those parts of the world that are growing — China, India and others — as being extremely large consumers of oil because the truth is that oil is the ticket to economic development, and always has been,” said Daniel Kish, a senior vice-president at the Washington, D.C.-based research and policy group Institute for Energy Research. “Personally I think the prospects are good, and largely because there will be continuing demand for the fuel ... which is a high-quality fuel,” he said. One litmus test for shale oil will be Jordan. With Estonia’s help, the Mideast country plans to build an oil-shale fired power plant by 2017 and later a refinery for shale-based oil products. China, Brazil, and Russia have sizeable oil shale reserves, and small industries too, but the bonanza is in the U.S., which boasts a whopping 70 percent of the world’s reserves. So vast, in fact, is oil shale’s potential in the U.S. that Jack Gerard, CEO of the American Petroleum Institute, said in a speech in Washington, D.C. in January that in the western U.S. alone the volume of oil shale is estimated at 800 billion barrels — three times the proven crude reserves of Saudi Arabia. At current prices this much shale oil would be worth a staggering $65 trillion. Though subsidiary Enefit American Oil has yet to obtain the numerous federal, state and local permits to begin shale mining, the company is optimistic it will begin mine construction in Utah in 2017, with the first oil being extracted in 2020. Enefit’s ultimate target is to produce 50,000 barrels of shale oil per day. But talk of oil shale’s future makes environmentalists cringe. Shale mining in Estonia is water-intensive and pollutes underground water tables, while burning the rock for power produces loads of carbon dioxide, sulfur, and ash — even more than coal. “If you compare different oil products and different technologies used in the European Union, then oil shale is the dirtiest,” said Valdur Lahtvee, an expert at the Stockholm Environment Institute in Tallinn, Estonia’s capital. Burning oil shale for power is also inefficient, he said, since it uses only 36-38 percent of the combustible organic matter within the rock. Producing shale oil is far less harmful to the environment as some 3.5 times less CO2 is emitted, according to Eesti Energia. In other words, the emissions occur “on the road” when cars and trucks burn the diesel, which is why environmentalists have less strenuous objections to Estonia’s shale oil plans. “Everything depends on the oil price. The oil price moves this train,” said Aas.